This blog has been created to discuss arts marketing related issues in the United States. As I only post when something catches my attention, my posting habits are a little sporadic. Sometimes I will write a couple of posts in a week, and other times I will only post once a month. I have been feeling pretty guilty lately about not posting more, but nothing really jumped out at me until very recently. In the past couple of weeks, two things have impacted my work as a marketer--I was extraordinarily fortunate to attend a convening of Black playwrights as part of the American Voices New Play Institute at Arena Stage, and I finally got around to reading Outrageous Fortune, the new report put out by TDF about new play development. Via both contexts, I heard numerous complaints about how institutional theaters market new work. It became clear to me that marketing directors, in some cases, have the ability to kill new work. In Outrageous Fortune, one playwright contends that institutional theaters are "about a certain kind of system...when plays come in, they want to systematically find a way to market them." Another playwright states that new play production "comes down to marketing. Some say we love this play; we can't find the audience for it. It pisses me off, because a lot of people in marketing don't know how to find new audiences." It is easy for marketers to take offense, however we should admit that at too many institutions, this is the case. Marketing directors are like anyone else; we are creatures of habit. If we have been in the job for awhile, we start to develop systems for marketing products. We know how to market musicals, new plays, African-American work, political satire, etc. But what happens when the Artistic Director brings us something that we can't pigeon hole? Well, I guess that depends on the person sitting in the marketing director's chair. Some of us get excited as it presents an opportunity to learn and grow, and a chance to build our audience base. Others might be daunted, and instead of facing the challenge, they retreat to the comfort of the known. But let's be clear--whether we accept the responsibility or not, it is our job to find an audience. The audience for more challenging, esoteric work might be smaller than a crowd-pleaser, but either way it is our duty to go into the community and find those people to support the work. In thinking about this issue, I am reminded of a piece of advice my mentor gave me in graduate school. She said a producer's job is to find ways to say yes. 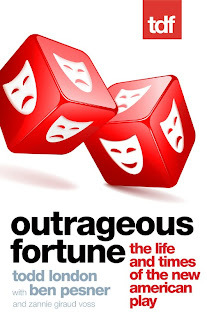 While reading Outrageous Fortune, I had an interesting interaction with a playwright. When questioned why a play hadn't made a commercial transfer despite being critically acclaimed, the playwright said the producer had a difficult time projecting revenue due to the late buying habits of the audience. To all those on the outside, it was almost impossible for us to understand why a commercial production would not be forthcoming. If it was indeed a case of projecting revenue, then the marketing director has failed this extraordinary new play. Just because our jobs become difficult doesn't mean we have the luxury of being able to choose to carry out our responsibilities. Revenue forecasting is incredibly difficult, especially in light of the current economic crisis. However, who better to forecast revenue than those with the tools to do so? Are these cases of marketing directors behaving badly? It sure looks that way. We got into our jobs knowing the territory. We are tasked with developing new audiences, supporting the mission of the institution, forecasting revenue, promoting all types of work, etc. If you don't like any of those tasks, then you should move on. Maybe the job isn't for you. Don't jeopardize the livelihoods of playwrights, or the advancement of our craft, because you don't want to take on a tough task. That being said, before I finish this post, I wanted to mention that there are two major sources of revenue at non-profit institutions--earned revenue and contributed revenue. If marketing objectives have the ability to sacrifice your institution's mission, then I would argue that you have become too reliant upon box office revenue. For-profit companies focus on one thing: building a product that has audience appeal sufficient enough to make the most possible profit. Non-profits as well have a singular focus: fulfilling their mission. At no point can marketing objectives jeopardize an organization's ability to fulfill its mission. If you get to that point, you might as well become a for-profit entity. Chad M. Bauman is the Managing Director of Milwaukee Repertory Theater. Opinions on this blog are his own and do not represent his employers in any way. Previously, he was the Associate Executive Director of Arena Stage, the founder of the Technology in Arts Management program at American University and the Director of Marketing and Communications at Americans for the Arts. In addition, he is on faculty at the California Institute of the Arts and Drexel University. As a speaker and consultant, he has worked with a wide variety of clients including City Theatre Company, Carnegie Hall, The Flynn Center for the Performing Arts, the Philadelphia Cultural Alliance, St. Louis Regional Arts Commission, ArtsMidwest, the Arts & Business Council and the National Arts Marketing Project. For three consecutive years starting in 2011, Washington Life Magazine named Chad one of the most influential leaders under 40 in our nation’s capital. M.F.A Producing – CalArts; B.S. Ed in Secondary Education – Missouri State University.